Acacia cognata are a narrow leafed wattle, sometimes called the ‘River Wattle’. 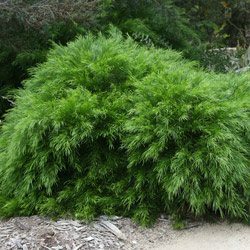 It is the smaller growing cultivars including ‘Limelight’, ‘Green Mist’ and ‘Waterfall’ that are most popular and all have been developed from the natural form, which is a small weeping tree. The newer cultivars especially dwarf forms such as Acacia cognata ‘Limelight’, Acacia cognata ‘Lime Magik’ and Acacia cognata dwarf ‘Mini Cog’ are perhaps one of the most successful developments in Australian Native plants in recent years with a number of varied cultivars being developed. Becoming particularly popular especially the dwarf or low growing forms such as Acacia cognata ‘Limelight’, Acacia cognata ‘Lime Magik’, Acacia cognata dwarf ‘Mini Cog’ and ‘Little Con’ are all popular. All A. cognata do well in full sun to part shade and prefer a drained soil. Pruning is not generally required although tips can be trimmed to keep in shape. Acaia Cognata ‘Bower wattle’ or ‘River Wattle’ cultivars all prefer a sunny well drained position. Once established Acacia Cognata species are relatively drought tolerant and are useful both as specimen plants and as hedging plants. A. Cognata cultivars vary in height from 75cm through to 6-8m. The dwarf forms receive much attention, however we believe that that the taller growing cultivars such as A. cognata ‘Copper Tips’ are also of equal value in landscaping especially for use as screening plants. A. cognata ‘Bower Beauty’ is a dwarf form growing to approx 1m. Great green foliage and striking orange/bronze new growth. A.cognata ‘Copper Tips’ is a small weeping tree growing to 6m depending on conditions. Really nice bright green pendulous foliage with copper colored new growth. Makes a nice small specimen tree or could be used as a hedge or screen. A. cognata ‘Lime Majik’ Lighter green foliage than some, tall to around 4m with a nice weeping habit. A. cognata ‘Waterfall’ lives up to its name, great for trailing over a retaining wall with green foliage that will cascade down the wall for 2m. A. cognata ‘Fettucune’ is a compact low growing cultivar growing to 75 – 90 cm. Maintains a nice shape and is suitable to use as a low border plant or a a specimen in the border or in a container. A. cognata ‘Green Mist’ and ‘Limelight’ will grow to 1m, again a nice weeping habit and great landscaping plants. A. cognata ‘River Cascade’ will grow to approx 1m and again makes an excellent low hedging or border plant. Acacia cognata varieties are available for sale from the following nurseries.